If you want to make progress toward your fitness goals, try using your bullet journal for weight loss tracking! Keep reading for a bunch of creative ways to use bullet journal spreads for weight loss and fitness. Can bullet journaling help you lose weight? Sure! If you already use a bullet journal to track your to-do list, you’ll find it easy to use your bullet journal to track progress toward your weight loss and fitness goals. Bullet journaling can help you track the healthy changes you’re making to your diet and exercise routine. And, bullet journaling can clue you into patterns — like eating, sleep, and water intake — that impact your overall health. For many people, the simple act of writing their goals down on paper reinforces their desire to accomplish them. And keeping a habit tracker can motivate you to “stick with it”, even when progress is slower than I’d like. The basic bullet journal system is very simple. In your bullet journal, you can log tasks, events, and notes in short-form sentences — aka “bullets”. It helps you organize your thoughts and tasks and intentionally plan your schedule. To start your first bullet journal, you’ll only need a few supplies. I recommend purchasing a dot grid notebook like a Moleskine or a Leuchtturm. Then, you’ll need a few nice pens to start. Later, you can add some nice pastel highlighters, some brush pens, or even some colorful markers to decorate up your bullet journal spreads. After you gather your supplies, make sure to read The Ultimate Bullet Journal Setup Guide for Beginners. Of of the greatest things about this free-form planning system is that it’s infinitely customizable. You can adapt it however you’d like to suit your own needs and lifestyle. So, if one of your goals is to improve your health and fitness — you can make a bullet journal spread for that! There are a lot of ways that you can set up your bullet journal to support your weight loss and fitness goals. You can make your layouts as simple or as elaborate as you want. It’s totally up to you. Here are some of my favorite ideas. 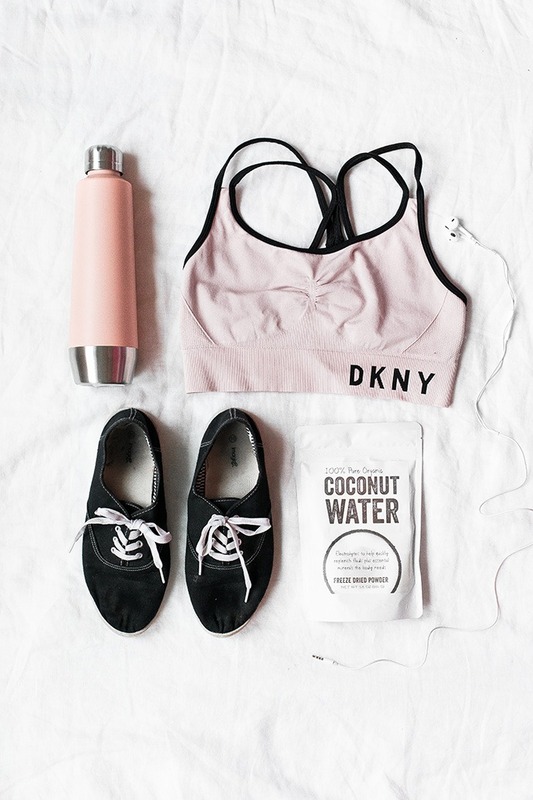 First things first — You don’t have to log your weight or measurements to be healthy. That said, some people find it very helpful to track their weight in order to see progress and stay motivated. Remember that weighing yourself too often won’t be a good indicator of your true weight loss progress. So, try to measure yourself only once a week — preferably at the same time and under the same conditions from week to week. It’s a great idea to set activity goals to improve your overall health — regardless of whether you’d like to lose weight. You can create a mini-tracker for activity goals, like reaching 10,000 steps. Or, you can use your bullet journal to log miles. If you are interested in strength training, you can even set up a spread to track your one-rep max for certain exercises. If you are trying to watch what you eat, try using your bullet journal for healthy meal planning. You can write down a list of healthy groceries to buy that you can bring with you to the grocery store. Not only will this help you stick to your diet plan of healthy foods — but it can also help you save money and avoid impulse purchases. And some people use a spread in their bullet journal to pre-plan their meals for the upcoming week. Planning your meals ahead of time will help you make healthy choices, and save you time in the kitchen. Plus, meal planning in your bullet journal can help you avoid the temptation of weeknight take-out. You can also track your intake of calories, carbohydrates, protein, healthy fat, and veggies in your bullet journal. This can be a great way to see trends in your eating habits. And, seeing your intake written out on the page may inspire you to stick with your new, healthier eating habits! Keeping a log of your healthy habits can be a great motivator! Using habit trackers in your bullet journal will help keep yourself accountable to your fitness goals. You can use a water intake tracker to make sure you get in at least 8 glasses a day. You can set up a sleep log to make sure you are getting enough rest. Or you can fill in a gym log to motivate you to keep your streak going! Filling in a little square each day can help you feel good about your accomplishments — regardless of whether you’ve lost weight or not. 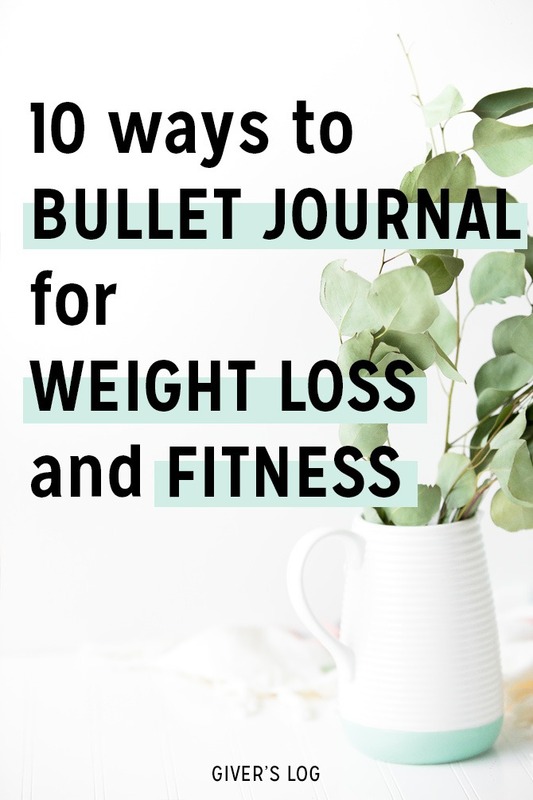 Here are some more ideas for using your bullet jouranl for weight loss and health. If you are looking for even more bullet journal inspiration, check out Simple Bullet Journal Key Ideas to Keep You Organized. And, to make your bullet journal pages even prettier, don’t miss 12 Bullet Journal Fonts That You Can Draw Right Now. And finally, if you are looking to save money, look for 12 Bullet Journal Budget Trackers to Help Manage Your Money. And if you love bullet journaling, follow our board on Pinterest.